After a computer and internet free long weekend I guess it's about time that I blog here again. While the weather wasn't as good as in 2003 and 2004 I still had a good time in Scotland. Unfortunately the Blogger Glühwein didn't work out, as Stuart and Gordon saw my entry too late and I didn't see their e-mails until I arrived back in Swindon late Monday evening. Well, I guess I left it a bit late, so next time I'll try to arrange something earlier. So what did I do during the four days? Having driven to Carlisle on Wednesday evening I continued to Glasgow on Thursday morning, where I arrived at lunchtime. After checking in I went to George Square for a quick look at Glasgow On Ice (not that great during the day) before walking over to the German Christmas Market at St Enoch for a Bratwurst and some Glühwein. Followed by spending way too much money at the book stores. 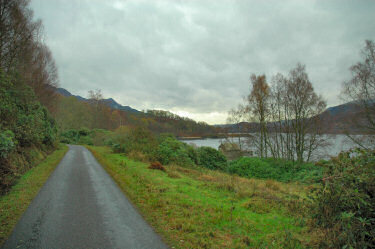 On Friday I drove out to the Trossachs, hoping to go hillwalking. But the weather thought otherwise and didn't want to cooperate, very cloudy with frequent rain until early afternoon. 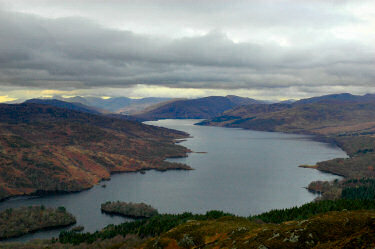 So I just went for a walk along the road around Loch Katrine. On the way back I stopped at the Beech Tree Inn for an excellent dinner (huge portions as well). Saturday I decided to give the Trossachs another chance, this time the weather was slightly better and I walked to the summit of Ben A'an (454m). The view over Loch Katrine was impressive, I could also see the Arrochar Alps in the distance (the clouds over the Munro summits only cleared very briefly though). 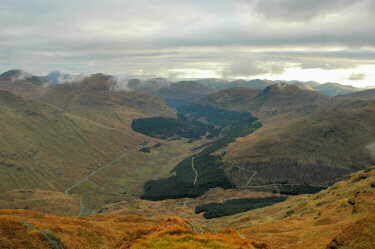 Sunday as the last full day was my last chance for a long walk and I decided to drive out to the Arrochar Alps. 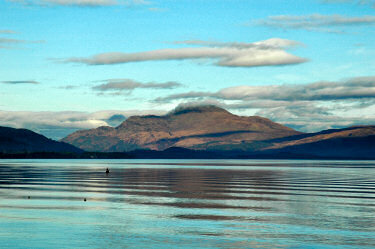 On the way I had a great view of Ben Lomond over Loch Lomond (climbed in 2003). But that wasn't my destination, instead I decided to complete some unfinished business and walk to the summit of Beinn an Lochain (901m). I started in brilliant sunshine and with some great views. When I was about half way up the hill I thought I was going to be thwarted again: Clouds and fog moved in, reducing visibility to may be 100 yards. Hoping that it might clear up again I continued to the summit, using map and compass to find my way. The weather hadn't changed much when I arrived at the summit and while I was at the summit. Just as I was leaving it started to clear up and I was presented with some great views over Loch Fyne, Loch Long and the Arrochar Alps. After a last Bratwurst at the German Christmas Market on Monday I drove back to Swindon on Monday afternoon, arriving back in Swindon in the evening. I plan to write a short travelogue (hopefully completed before the end of this year) once I've finished the Scotland Summer 2005 travelogue (hopefully next weekend).